Early mystery genre detectives certainly had their foibles and idiosyncrasies. Dupin had his aversion to sunlight, Holmes’s habits—good and bad—included the violin, mood swings, and opium, Lecoq communed with a portrait of his wife, and Poirot was fastidious to the extreme. These character traits have served to create unique and memorable characters that have become beloved by readers the world over. This Winter, the mystery book discussion group at my library will take a look at “Unusual Sleuths.” These contemporary mysteries feature detectives that would definitely distinguish them from the common rabble of fictional detectives. As before with the discussion series, “A Taste of Murder,”—which concludes in December—I invite readers of The Poisoned Martini to join me online in sharing their love of mysteries. Comment on this post with some of the most unusual sleuths you’ve encountered in mysteries and join me in reading the books in the “Unusual Sleuths” series. 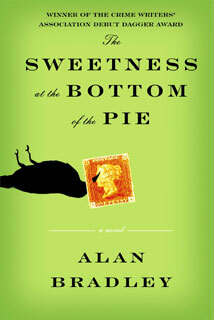 For January, read Alan Bradley’s first mystery, The Sweetness at the Bottom of the Pie, featuring Flavia de Luce, a darling little girl with a passion for poisons. In 1950s England, young Flavia is appalled and delighted when murder comes to call. An aspiring chemist, Flavia is intrigued by a series of inexplicable events: a dead bird on a doorstep with a postage stamp pinned to its beak and a man found dead in a cucumber patch hours later. 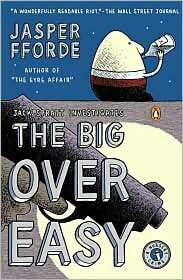 Then in February, take up the call to discover Humpty Dumpty’s killer in Jasper Fforde’s The Big Over Easy. In this spin-off series (from the Thursday Next books), Jack Spratt of the Nursery Crimes Division is tasked with finding out who wanted the big egg dead. Finally, in March, it’s off to Ireland for Leonie Swann’s Three Bag Full. It really doesn’t get more unusual than this. When a beloved shepherd is murdered, his sheep set about to solve the crime, exposing and Irish village’s secrets in the process. See what you think of these atypical detectives, starting next year. In the meantime, don’t forget to check out the “A Taste of Murder” series. See the book list here. And have you voted in the poll? What’s your take on Character vs. Plot? Reviews for the “Unusual Sleuths” series will appear around the middle of the month for which they’re selected. Look for them and share your thoughts on these delightful reads!